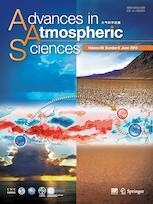 Advances in Atmospheric Sciences, launched in 1984, offers rapid publication of original scientific papers on the dynamics, physics and chemistry of the atmosphere and ocean. It reports on the latest achievements and developments in the atmospheric sciences, including marine meteorology and meteorology-associated geophysics, as well as the theoretical and practical aspects of these disciplines. The coverage includes weather systems, numerical weather prediction, climate dynamics and variability, satellite meteorology, remote sensing, air chemistry and the boundary layer, clouds and weather modification, can be found in the journal. Papers describing the application of new mathematics or new instruments are also collected here. Advances in Atmospheric Sciences is sponsored by The Chinese Committee for International Association of Meteorology and Atmospheric Sciences (IAMAS), and the Institute of Atmospheric Physics, Chinese Academy of Sciences.